There must be lots of canned asparagus recipes out there because so much canned asparagus is sold. However most of it is sold on the continent and we are just starting to experiment with various jars and canned produce as it is not particularly popular here in the UK. We had the first recipe on this page last night with smoked salmon as a starter and it was very very tasty. Give these recipes a try and come back soon by which time I hope to have some more canned asparagus recipes for you to try. This is very good with smoked salmon as a starter. Very tasty. I suspect it would be good as as a side dish with a Barbeque. Don't miss out the capers as they give lots of flavour. From my experience so far I wouldn't recommend swapping the white asparagus for canned green asparagus. The white seems much nicer to me. Capers are the unripened seed heads of a prickly mediterranean plant which are picked by hand and usually pickled. Mix together the white wine vinegar and the olive oil, whisk with a fork and add salt and pepper and pour over the peppers and onion in a shallow dish. Chop the capers and hard boiled eggs and gently mix into the olive oil and vinegar mix. Leave to marinate for 20 - 30 minutes. 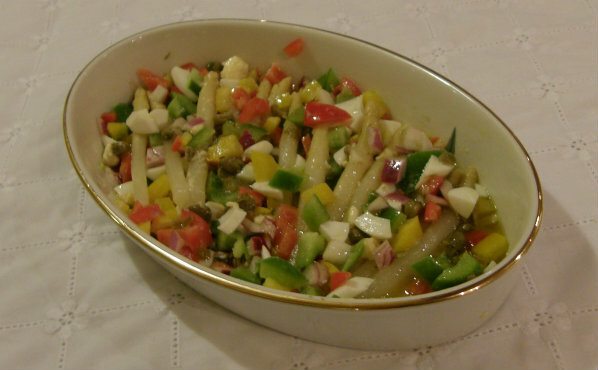 Open the canned asparagus and lay on top of the mixture. Serve as a side dish or as the major part of an appetizer perhaps with smoked salmon, cured ham or similar. 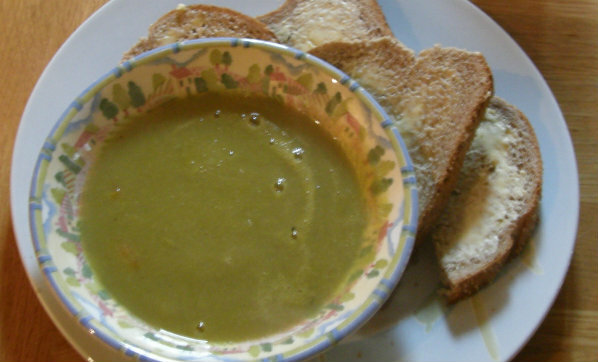 If you have a few left over vegetables and a can of asparagus in the cupboard you can make a suprisingly tasty soup in between doing a few other chores. What could be better than homemade soup in the winter? What have you got left over today? A few green beans, half a tin of sweetcorn, a few mushrooms, courgettes, sweet potatoe, butternut squash...?